I never liked Star Trek. I always felt like it was the old folk’s version of Star Wars. The VERY old folk’s version. Whenever I did try to watch it growing up it always seemed like it had MUCH more dialogue then action so it could never compete with Buck Rogers or Battlestar Galataca. And don’t think Star Trek The Next Generation or Star Trek Deep Space Nine got my attention either cause at the end of the day, I didn’t think there wasn’t anything that these cats could do to convince me to get into Star Trek. Which is why when I saw the trailer for the Star Trek movie that dropped a couple of years back I was shocked that I actually wanted to see it! It was like after 40 years it seemed like these dudes FINALLY got the bright idea to add some action to this snooze fest. 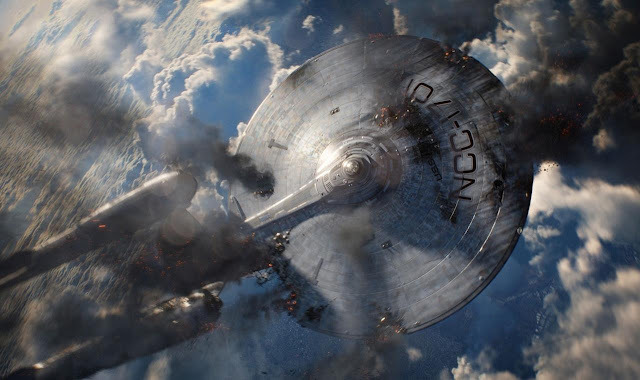 And ya’ll could only imagine the shock I was in after I checked out the movie the first day it dropped (along with a RACK of “Trekies” in the theater) and I LOVED it! Now don’t get it twisted I’m not saying it was a 5 mic classic or nuthin’ like that (hell, casting Tyler Perry alone made it lose a half of mic) but it was finally the Star Trek that I’d been wanting to see since day one. 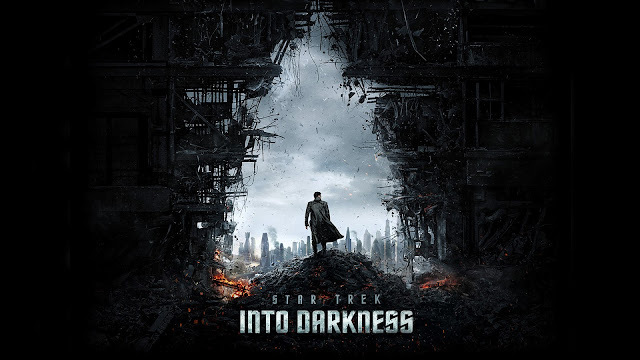 So it should come as no surprised that I was hype as hell when Star Trek Into Darkness dropped this past Friday. To be honest, outside of Django I can’t remember the last time I was this hype for a movie. So after copping my ticket for the first showing of the movie a couple of days in advance (cause I knew the jawn would be sold out) I found myself back in the same position I was in 3 years ago, checking out the very first movie of the day with a RACK of Trekies again…the only difference this time is my expectations were much higher then they were the first go ‘round. So, is “Into The Darkness” better then the original? Well, yes and no. “Into Darkness” has everything you’d expect from a summer blockbuster movie (even though it’s dropping 2 weeks before the “official” summer, but mark my words, this will be the best movie of the summer and yes…I know Superman is dropping) so it has much more action then the 1st Star Trek but to me the real greatness of the movie are the characters and the way they interact. Since I started working on my first novel and just finished my first screenplay, I’ve started paying much more attention to characters in movies and I’m completely floored by the characters in Star Trek. And it’s not just that the characters are ill but the dynamics between the characters (Kirk & Spook, Kirk & Bones and Kirk & just about anybody for that matter) is just as sick. And to be honest the only real knock I have against “Darkness” it is at times it was so predictable that I felt like I already read the book before seeing the movie. But even with the predictability factor, you’d be damn near hating to not like this movie…that is if you gave the last movie a shot. So even if you were like me and never rocked with Star Trek because it was boring, dull and it seemed like it was written for our ancestors, trust me, if you want a dope action movie with some ill characters, “Darkness” is right up your alley. Plus, Madea doesn’t make the cut this go round so like Big Boi said ("I gotta hit the Source, I need my other half of mic, cause that Southernplayalisticadillacmuzik was a classic") “Darkness” get the extra half of mic the lost last time for that alone. BTW, as much as I hated Star Trek growing up, for some odd ball reason…I always loved the Enterprise. In fact, it’s my 2nd fave spaceship only behind Star Blazer’s Argo. Hell, the Enterprise even comes before the Millennium Falcon…go figure.